We deal with lists day in and day out. In our applications, we often face situations where we have to display arrays as lists whose items change dynamically. So, hardcoding array items in our HTML is not really an option. It is important that we know how to handle these dynamically changing arrays with Vue and not so surprisingly, we have another directive for just that! Tada, it’s v-for! As always, we will dive deep with loads of examples for clear understanding. The most frequent and simplest scenario we face is to loop over the items of an array and render them as a list. Below is an array of greetings in four different languages which we would like to display as an unordered list to our webpage. Okay, don’t panic! I will dissect this information word by word. The special syntax that we have for the v-for directive here is, “greeting in greetings”. Firstly, greeting – it is recommended to use a singular noun, greeting in our case, as an alias for the array element being iterated on. This can be any name of your choice which can then be used in our code to address each array item. 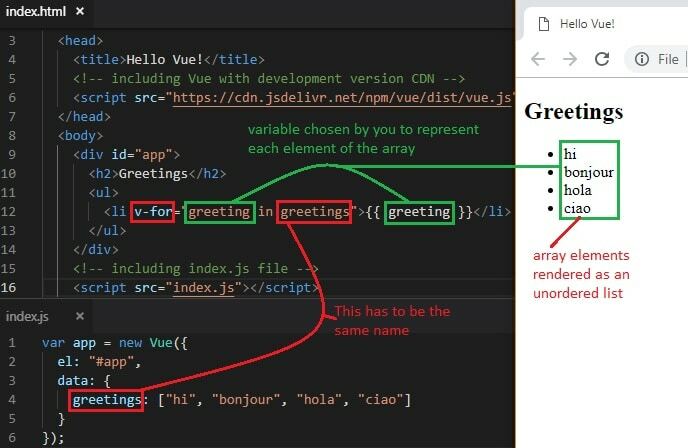 Finally, greetings – this has to be the exact same name of the array as in the Vue instance’s data object. An alternative to using mustache syntax is to use the v-text directive. It sets greeting as the text content. The same result will be rendered. Let’s take a trip down the memory lane. We learned that the beauty of Vue lies in its reactivity. Quick recap: Keeping the state and view in sync. In other words, Vue not only renders the data in the DOM where it is being referenced but also updates it whenever its value is changed in the data object. Let us see this in action, one more time. Open Chrome DevTools with the shortcut F12 and click on ‘Vue’. 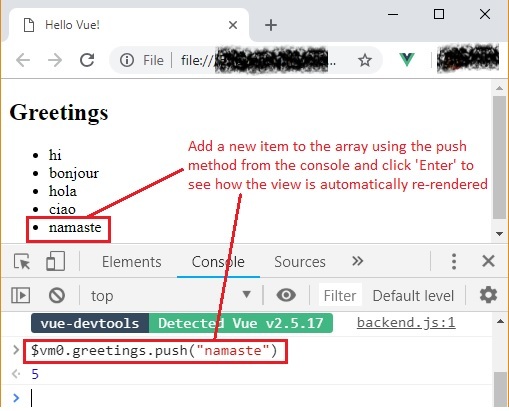 This panel will only be present if you have followed along with our tutorial series and installed Vue Devtools Chrome extension. 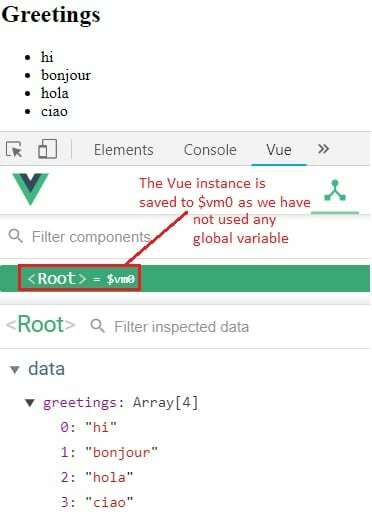 Since we have not used any global variables to refer to the Vue instance in our index.js file, it will be saved to $vm0 by default. This can be seen once you click on the <Root> as shown in the below image. So, let’s use $vm0 to access the Vue model from the Developer Tools Console. Let’s go to the console and use the push method to add one more greeting to our greetings array and see if the view is updated reactively (magically!). A developer’s life has no pause button! We are expected to accomplish unexpected things such as accessing the index of the array item along with its content. We know how to render the array elements with Vue but is it possible to get its index too? Well, the answer turns out to be YES! We have to introduce a parenthesis and specify two arguments separated by a comma, whose names can be of our choice. 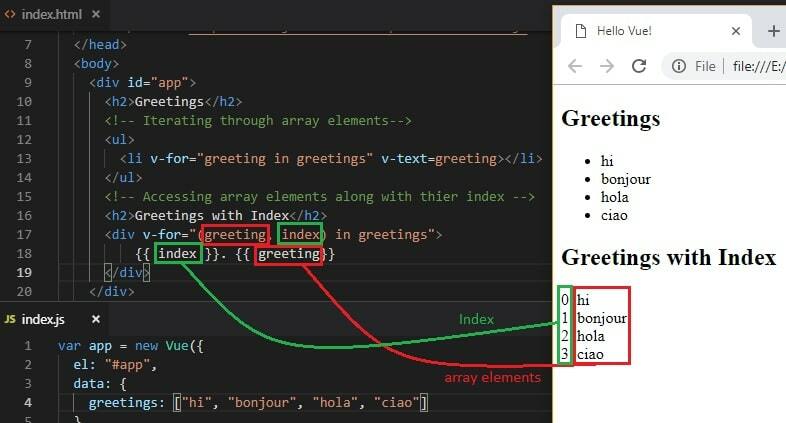 The first argument refers to the array element – greeting in our case. The second argument is optional and it refers to the index of the current item being looped – index in our example. This order is the most important thing to remember here. Whatever names you give, the first is always the array element and the second is the index in the v-for syntax. It can then be used with those names in the code as required. Let us take a look at the final code. All the code discussed above is also available in the GitHub repo. Feel free to fork the repository and run some experiments. We will be looking at how to iterate over objects with v-for in our next post. Until then, keep practicing! Hey Vue? What’s up? What’s the deal?